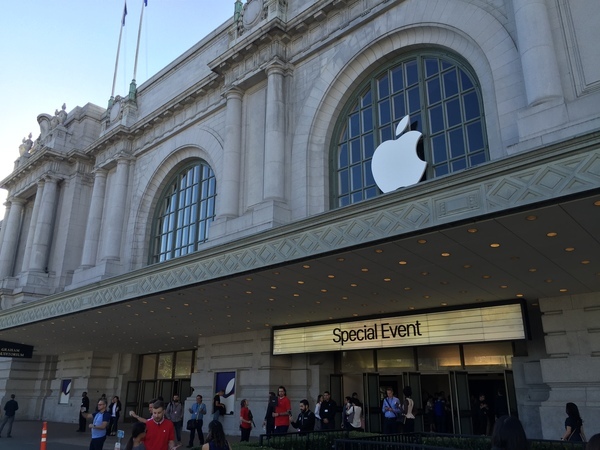 Join us as we join Apple in San Francisco for the anticipated unveiling of the new iPhone 6s, iPhone 6s+, 4th-generation Apple TV, and possibly new iPads. 1st time I was here at the Bill Graham (& first visit to SF!) was for Apple Fest 1992, 23 years ago, & then for a Mac OS X briefing ~2003. 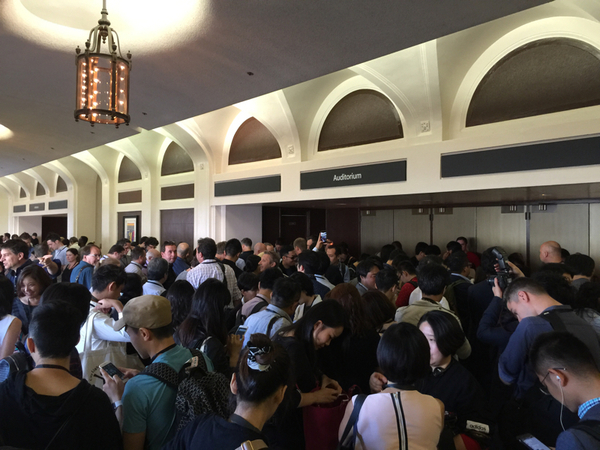 Overheard some of the ~2000 Apple employees here talking about how hard it was to sleep before the big event that is "finally here"
More conformations among the crowd that this Apple Event will be "epic"
Media is huddled up waiting to enter the auditorium. Appears Apple employees are on the second floor balcony. What are you excited to hear about? Rumors make it sound like Apple TV will be following along the lines of Apple Music and Apple News. I want a faster iPhone, and looking for how they are going to use Force Touch on it. 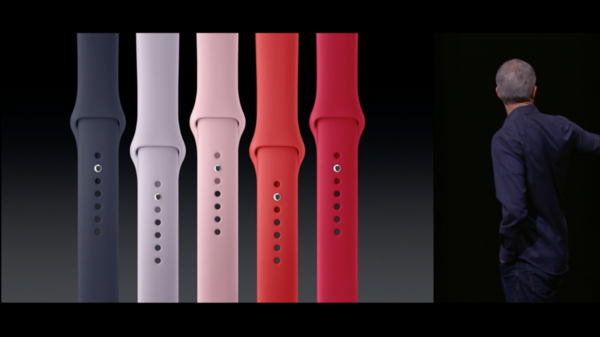 And watchOS 2.0 taking Apple Watch to a new level. Looks like doors open in the next :30. Can already hear pounding music in the auditorium from entry hall. Employees must be having a party. Likely we will see the full fruits of Metal to empower gaming on Apple's latest A9(?) Apple TV. I asked Siri but she won't say. Did anyone notice that Siri's voice sounds different? I asked about that too and got evasion. 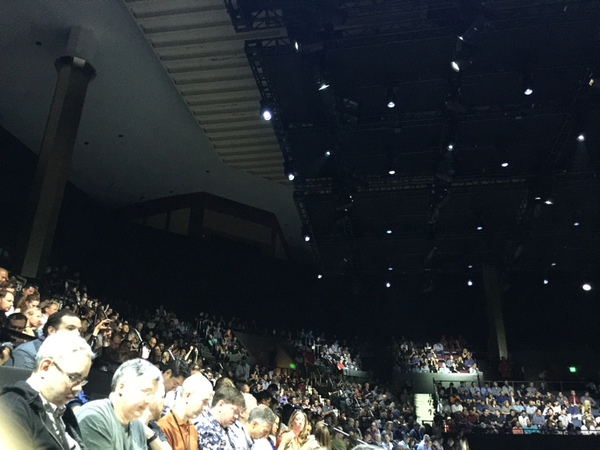 Apple installed a massive drop ceiling inside Bill Graham, and the entire second level of nosebleed seats are not being used. So the "7000" max seat capacity of the BGCA arena isn't being used, just the large, central area. It feels like a massively wide theater. Here you can see the upper level obscured by the really large drop ceiling of lighting. All the seats are good seats. I've been traveling nonstop in Europe for six weeks, and technically I was in Dubai yesterday, so please forgive any delirious typos! 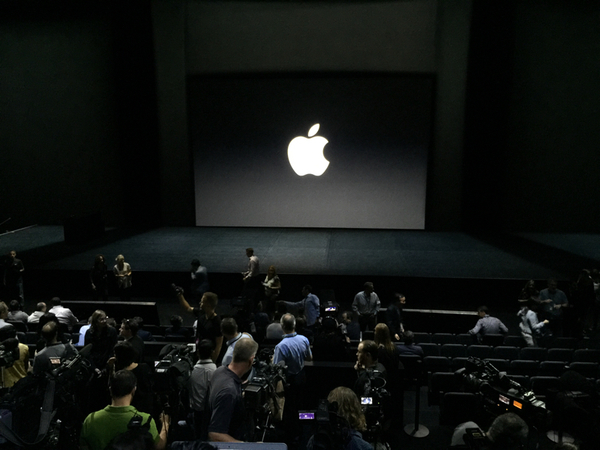 Second tier of seating is all Apple employees. They exploded in cheering when Tim Cook welcomed them. 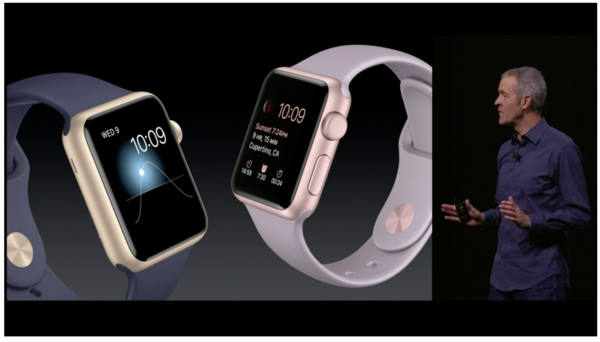 Jeff Williams reviewing watchOS 2 with transit maps, 3rd party complications. Already 10k watch apps in the store. 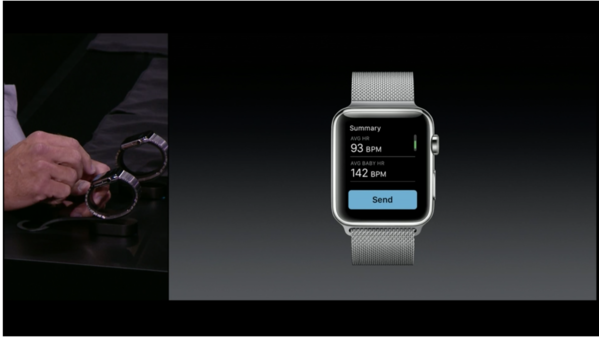 Apps can access hardware like the mic and health sensors. 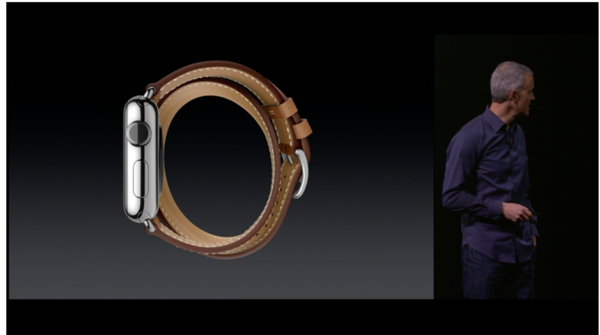 Williams is showing Facebook messenger on the watch. AirStrip demonstrates "just how far developers can go," sharing position with teams. 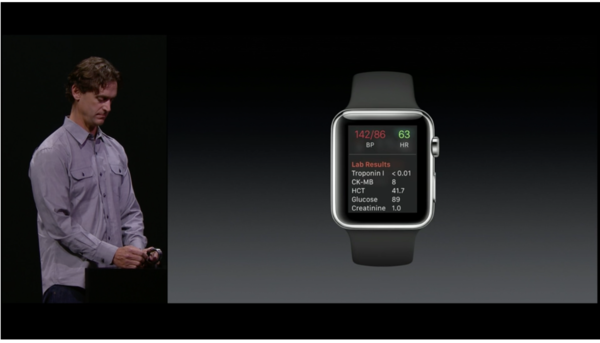 "I can see the live data and this wasn't possible until Watch OS 2." 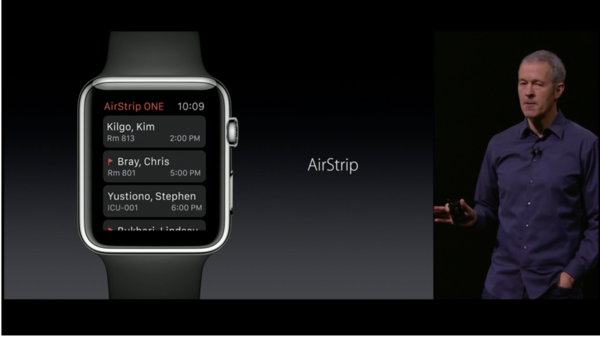 AirStrip allows sending data to a member of a patient's care team. "It will change how doctors communicate with their patients." "AirStrip using Sense for Baby sensors can monitor a mother's heart rate and a baby's heart rate separately. While she's doing this test, the mother can listen to the baby's heart rate right on her wrist." 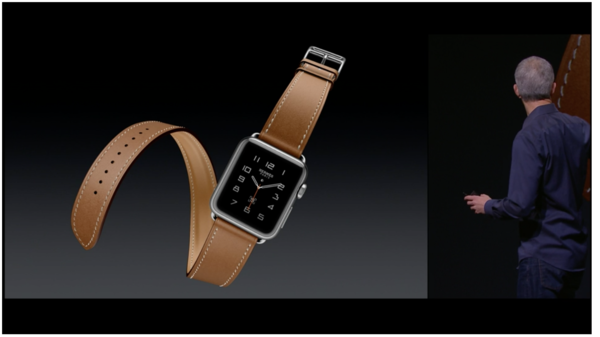 Interesting fashion releases of Apple Watch bands for new seasons. I think nobody realized Apple would be doing this.